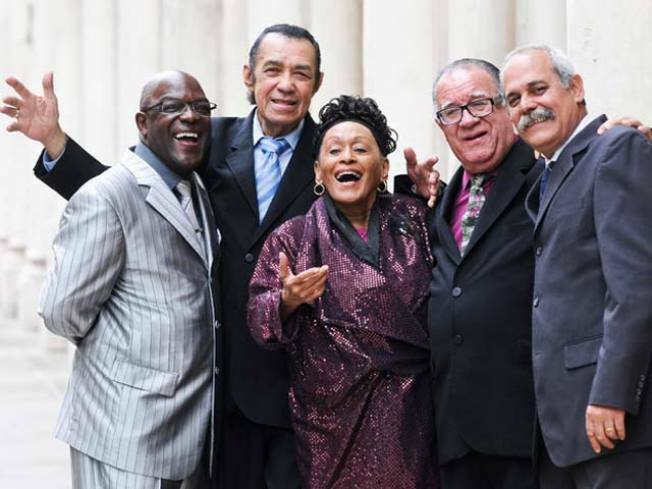 The Orquesta Buena Vista Social Club plays the Prospect Park Bandshell tonight. ON ISLAND TIME: It’s hard to underestimate just how widespread and lasting of an effect the Buena Vista Social Club documentary has had on the world music scene. Proving its appeal undiminished, the Orquesta Buena Vista Social Club promises to bring a little piece of old Havana to the Prospect Park Bandshell tonight as part of Celebrate Brooklyn! : Original BVSC female vocalist Omara Portuondo will be on hand, and flamenco spectacularist Nelida Tirado will warm up the stage. Free/$3 donation suggested. Gates at 6:30, show at 7:30PM. SING SING: Sean Hayes—fresh off his Tonys hosting gig, and no doubt still trying to get spirit gum out of his hair from the wig—fetes the release of the cast recording of Broadway’s Promises, Promises with Kristin Chenoweth and other castmembers at the Lincoln Triangle Barnes & Noble.5PM. NU VAUDEVILLE? We recently had the opportunity to finally catch Sxip Shirey—self-professed maker of “circus music”—live on stage when he opened for (and accompanied) Amanda Palmer’s Evelyn Evelyn show, and watching a grown man with a manic grey ’fro turn dimestore music boxes, marbles ricocheting around glass bowls and a worse-for-wear bullhorn into a one-man symphony about New York City leaves you nothing short of gobsmacked. He releases his new CD Sonic New York tonight at City Winery with Rhiannon Giddens of Carolina Chocolate Drops. 10PM.